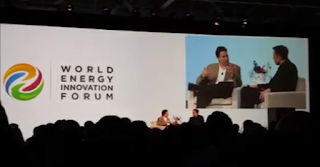 During his keynote speech this morning at the World Energy Innovation Forum 2016 hosted at Tesla's Fremont factory this week, Elon was interviewed by managing partner at DBL Partners Ira Ehrenpreis. The interview was a little bit over half an hour during which Elon spoke about his early days from starting his web software company Zip2 with his bother Kimbal to finally landing deals with the Air Force and NASA at Space X, going through Paypal and Tesla. Elon and Kimble had $2000 and $5000 respectively when they first started their company Zip2 and slept in the office to save on rent. Elon set five things as affecting the future of humanity when he was in college: sustainable energy: (both production and consumption), making human life multi-planetary, the internet and rewriting human genetics and AI. However he had doubts about the last two where it was not clear for him if the positive or the negative edge is stronger. He originally intended to work on the electric vehicle problem when he moved to Silicon Valley where he did his PhD. in applied physics at Stanford to try and figure out and advance energy sotrage techniques for electric vehicles. Then ended up putting that on hold to try do something on the internet. He did not want to miss on it. Ended up setting up X.com and Paypal. He didn't plan to be CEO of two companies, it just worked out that way, he found it a difficult thing and wouldn't recommend it. His obligations require putting a lot of amount of time. He prefers to reduce by 20%. He thinks working 90 hours a week for Space X and Tesla is not much. But on a personal basis it is quite hard. "The genesis code for Tesla was actually a lunch in 2003 with J.B. Straubel, one the co-founders. We were talking about electric planes and space stuff and then conversation turned into electric vehicles, he mentioned a little company in California called A.C. Propulsion which created 'tzero' electric prototype sport scar... I did a test drive in the 'tzero' and tried to convince A.C. Propulsion to commercialize it , it was a cool concept but didn't have roof or safety systems... but it showed basic fundamentals of what an electric sports car could do. They deserve a lot of credit for Tesla. I Couldn't convince them to commercialize it... I joined up with other people interested and created Tesla. In the beginning we didn't actually own the trademark, it was owned by somebody in Sacramento. We had to change the name, we battered around various names... Faraday was our second choice. Faraday was the guy who invented the electric motor. Tesla invented the AC induction motor which is the type used on the Roadster". Elon was the fourth CEO of Tesla, finally decided to take it over by 2008. His initial goal was working on product design & engineering and allocated 20% of time to Tesla and then he tried the succession CEOs and didn't work out. In 2008 he was faced with choice either Tesla goes bankrupt or putting all his money in Tesla and Space X. He decided to put all his chips on the table and play the hand himself. Elon's fundamental properties of people to hire: really driven, smart, being self critical. Those can pick something else very quickly. "The incumbents are resistant to a new technology... there's an opportunity for a new company when there's a significant technology discontinuity... This opens up a world for new startup. The world didn't need another car company that made gasoline cars, there are plenty of those, but no one was doing electric cars. The reason we put all effort in Tesla because no one was doing electric and everyone thought it was stupid. And the big companies thought it was dumb and startup weren't doing it, it has to come from a startup, so that was our only option. After we demonstrated the Roadster, Bob Lutz picked up the Volt program which then also enabled the Nissan Leaf program, so even though the Roadster was very low production vehicle and didn't make money of it, it had a leverage effect in forcing GM and Nissan to do EV programs. Bob Lutz comparing us with inspiration to the Volt program. Tesla had an outside effect on the industry even in the early days. The biggest effect of Tesla would not be the cause made directly but the cause we induced others to make". "It is going to become common for cars to become autonomous, a lot faster than people think. Probably, i guess 7-8 years from now, half of all cars produced will be autonomous. 10 years for sure. It will be odd if it is not in your car... like not having a GPS now, but even bigger, it will be normal. ... it will certainly have higher utilization of cars, most people will want to have their own car, just like their own house... A Sharing economy is significant but not involving cars. Mostly people want their own car, just like their own house and their own clothes". 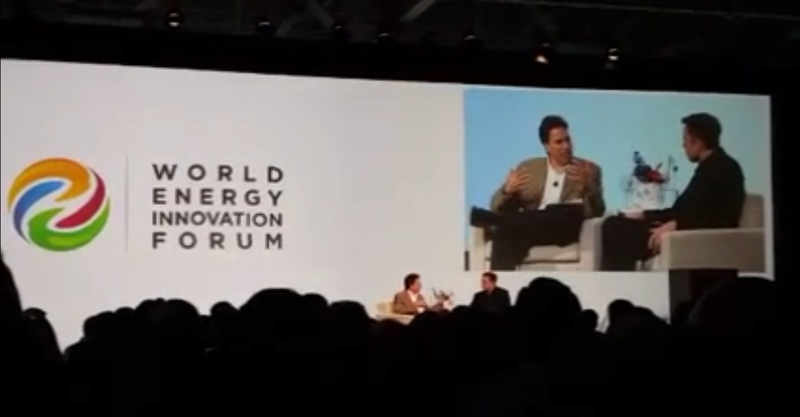 "In order to solve the energy problem, you have to get the cost to be competitive with fossil fuel. The fundamental issue with fossil fuels is subsidies, whenever you're not paying the true cost of an unpriced externality you're effectively subsidizing something, it would be like if you could just dump garbage on the street and not pay for garbage pick up. That's obviously a subsidy. Every gasoline car on the road has a subsidy, it is a subsidy of the public good. The right way to address the gasoline car subsidy is carbon tax...but passing a carbon tax is usually politically difficult particularly when you have enormous lobbying power on the part of the fossil fuel industry and preventing that from occurring. So politicians use to choose an easier path by providing subsidies to electric vehicle which they usually don't equal implied subsidies of gasoline vehicles. And then of course they get attacked like as though they are subsidized and gasoline cars are not when in fact gasoline car are getting bigger subsidies of the public good than electric cars are". "Because oil is so cheap, and fracking technology has driven the costs down dramatically, what this effectively does is weaken the economic ....policy function to transition to sustainable transport and energy in general. It is quite bad for the world. I was encouraged by the Paris talks. These countries have committed globally to address the unprice externatlity of changing the chemical composition of the oceans and the atmosphere but it is happening slowly. And then unfortunately, technology advancements in fossil fuel extraction has improved tremendously and driven the cost down. It is quite worrying for the future of the world. The only thing we can do is try to appeal to people and educate them to revolt against this and fight the propaganda. After the IMF came out with their study showing that fossil fuels are subsidized to the tune of $6 trillion a year, like $6 trillion per year. Then some representatives from the oil and gas industry added up all the incentives that Tesla has received and will receive in the future, which happens to coincide with the $6 billion. This includes the account everything Tesla motors received over the next 20 years including the loan that was paid back with interest. So they wanted it to start with a '6'. So roughly a month or two after the IMF study came out, they started shopping that story around to journalists: "Tesla is getting a $6 billion subsidy" ... and they got the LA times to buy it, It was totally non-sensical. It's all part of the propaganda war". "It's pretty obvious that machine intelligence is on track to vastly exceed human intelligence. One of the things about an exponential [history of technology], in close up, an exponential and linear look similar. If you zoom in they look linear, but if you plot the points on a curve it's exponential... Even the benign scenario, there is a tremendous upheaval in terms of employment. If we have self driving cars, then what happens to the 12% population who's job is to drive the vehicles? These are profound question we are going to have to face in the future. But it is going to go beyond self driving cars, cars are not going to take over the world... It is going to feel like the operator of the elevator... Eventually A.I. will be able to do everything that we can do better than they do". "We're aiming to re-fly one of the landing boosters later this year. Falcon heavy, which will be the biggest payload vehicle to orbit since the Saturn V (1967–1973). That will be a fun one to watch. We are going to try to bring back all three side boosters to centre core, it is going to be synchronized gymnastics. Next year, we'll be transporting astronauts to the space station for the first time if schedule holds. Currently U.S.A. is dependant on Russia to transporting astronauts. We finally won Air force launch contract, Boeing and Lockheed Martin had been fighting for years to prevent us from being able to compete... and finally it was open up for competition, not the whole contract but just few of them. And we won our first serious Air Force launch contract. Looking forward to doing a lot of launches with the Air Force in the future. Our first mission to Mars by 2018, we're sending one of our Dragon 2 spacecraft to the surface of Mars using a Falcon heavy rocket... Dragon 2 is designed to land propulsively and it's got a heavy duty heat shield to withstand extreme heat when landing on Mars propulsvely. So This is an important path finder mission for the Mars colonization architecture". "The ultimate upheaval battle for Tesla and SolarCity is the price of carbon not priced correctly, which makes the problem much harder. In order to overcome that, Tesla is trying to make the case as compelling as possible. And for SolarCity, to get product differentiation on solar it is much harder. The rules on the game do not favor sustainable energy. That's something we need to fix collectively. I am excited by what I see in the level of energy with Millennials and younger people. It is just a matter of time before it happens, question is how long: To what degree did Tesla and Solarcity accelerate the advent to sustainable transport and energy? If we are able to accelerate it by a decade that would be amazing".